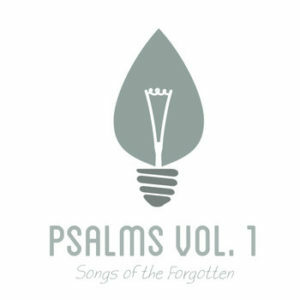 In an effort to musically reimagine some of the Bible’s darker Psalms, Garden City and friends have brought us Psalms of the Forgotten, a 10-song album comprising Psalms 3, 6, 10, 22, 31, 55, 77, 77, 79, and 88. It’s a collection of mostly rock tunes that succeed at highlighting the most hopeful tones amid the Psalmist’s dire circumstances. As the leader of a project setting all 150 Psalms to music in their entirety, the first thing I noticed is that this is not an entire-Psalms-to-music project, which isn’t at all a bad thing. The lyrics are drawn from various parts of the Psalm to set the scene and the “story,” while additional lyrics are grafted in at times to cement the song’s theme and make it more tuneful overall. It was difficult for me at first to adjust to the musical interpretations of Psalms 3, 6, 10, and 22, since I’ve set all of those Psalms to music myself, but once those biases were out of the way, I was able to enjoy the songs for what they were – upbeat, hopeful, takes on Psalms that relate to those in difficult circumstances. The music on the album is mostly guitar-driven rock (both acoustic and electric) with a full band and few additional instruments. The musicians are solid and deliver some effective dynamics. Dave Yauk is a skilled vocalist who easily carries the entire album, his voice as unique as it is earnest. Many of the songs switch from more of a minor-key feel in the verses to a major key in the chorus, creating an uplifting setting for triumphant pleas to God with melodies that really do get stuck in your head. I found myself singing them on and off during my day at work after listening during my morning commute. Standout tracks include Psalm 3 with its soaring, infectious chorus, Psalm 55 with its Third-Day-esque Southern-rock riffing and tight composition, and Psalm 77 with its start-and-stop, explosive plea for God to help the Psalmist “remember my song in the night” and “meditate on Your works in my heart.” All of the songs had their own merits and particular moments of sparkle. If I had one criticism of the album as a whole, it’s that the musical backdrop and melodies didn’t always seem to fully capture the agony of the Psalmist or make the listener “feel” the weight and depth of what was going on. One example was Psalm 88. It’s perhaps the darkest of all the Psalms, and so an excellent choice to set to music for this album, yet the score of its song is one of the most ebullient on the album, creating what could be perceived as an incongruence between the lyrics and music, despite the fact that the melodies are strong and some of the best on the album. Overall, I was pleased with and blessed by Psalms of the Forgotten. The tunes are tightly performed and melodically strong, the lyrics are about as Scriptural and poetically potent as can be (it’s hard to beat the Psalms), and the themes of hope in the midst of darkness run consistently throughout the album’s divinely-inspired supplications, providing a valuable and worthwhile contribution to the Psalms-to-music movement.